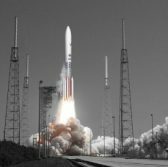 United Launch Alliance has selected Aerojet Rocketdyne to provide an upper stage engine technology to help power ULA’s Vulcan Centaur rocket. The space launch company said Friday Aerojet Rocketdyne will build RL10 propulsion systems and develop an RL10C-X variant as part of a 10-year partnership agreement between the companies. “Key determining factors to our selection included price and delivery schedule,” said Tory Bruno, ULA president and CEO. Aerojet Rocketdyne CEO and President Eileen Drake said in a statement published Friday the agreement offers a path forward that will help the company produce RL10s through additive manufacturing processes and advanced technologies. ULA intends to select a provider for the Vulcan Centaur booster engine via a competitive solicitation process.